Welcome back to Fashion Week at GLOGIRLY.com. Me and my fashionista friend Gracey from The Tiniest Tiger's Conservation Cub Club have a very special surprise for you today. Gracey is giving one lucky ready a Tiniest Tiger Tote from Triple T Studios! 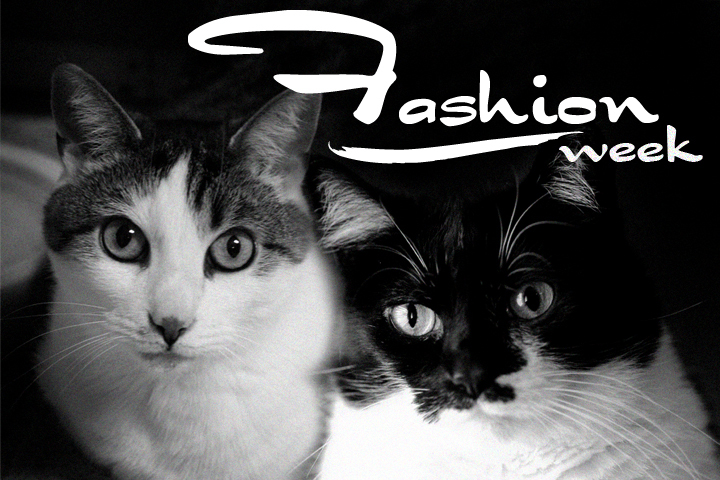 And what's more, it's chock full or goodies from lots of our other blogging kitty friends. *pssst* I hear there's even a limited edition GLOGIRLY pink pen! Kitties, this bag will make all your feline friends pink with envy. This one of a kind tote features The Tiniest Tiger's feline finesse quilted into the fabric. It's a subtle yet cool-cat design and purrfect for transporting your laptop and all your other essentials. Glogirly LOVES hers! It's the same bag all those savvy celeb's received at the Pre-Emmy Red Carpet Event and this one can be YOURS! Entering is simple. Just leave us a comment telling us what you're going to put in your Tiniest Tiger Tote and make sure we have your email address. The giveaway is open to everyone in the US, Canada, Europe and Australia, but only a US winner will receive the fully loaded bag and the Fling-ama-string. If the winner is from one of the other countries, you'll get the tote only...but the tote is the BEST part!!! The deadline for entries is Saturday, October 6 at midnight, CST. Good luck everyone! Fashion Week continues tomorrow with more glam and more Katie! I would put treats, water, dog blankie, calendar, sunglasses, phone, pen, & notepad in it! Maxwell: DOOD. Mama said you had to stop shipping Allie places or the Return Postage is coming out of your allowance. And since you already owe me for 4.7 years BACK allowance, I may feel compelled to send Cathy Keisha with a Cease and Desist letter. FaRADaY: No, wait! I came up with a reeeally good place this time. Besides, how was *I* supposed to know Whoville wasn't a REAL place?!?! Hey! Where ya going...? There's a Glogirly pink pen??? :-) I would fill the bag with my normal daily stuff, or maybe I'd use it to shop with at the outdoor markets. I would definitely put the Glogirly pink pen in the bag!!!! If I win the bag, I'm going to put my wild salmon jerky treats in the bag when I go out for walks so that I can share my treats with some of my dog and cat friends. I would love this. So gorgeous. First I'd have to attach my meow cat key ring from furracouse. Reminds me of my baby who lost his fight last year. This tote does too so it would be my main bag for purse, keys and close all the time. Love it. Glogirly pink pen would look fab in it too. Will the tote be able to hold one Sebastian? Anyway, my current country is not in the list though my former country is. Oohh...whatever. purrrr.....meow! I would love this to carry around all of my soap selling stuff. Of course the Farm cats would love all of the stuff inside. This is an AWESOME tote, and I should know because we have one! So of course don't enter me - but I did want to give it my paw of approval! And we LOVE the Fling-Ama-String! Sorry, but you have to give me your email in order to be entered. Otherwise if you win, I can't reach you. Most people have their emails linked to their profiles. Others will write it out in their comment. Mommy says I would be small enough to fit in it, and then I could sleep in it. Hmmmm. I think she could take it and put all her stuff in it so she can entertain herself when she's out and about (you know, newspaper, books, daybook, tissue, and lots of pictures of me! Or maybe me? So, here it is (we don't win much, but our Squillion, Maxie camed from an auction we won when mom had green papers): ladycristant at aol dot com. Katie - you are gorgeous. Your eyes really make me melt sweetie! I intend to put Thunder the Wonder Cat in it and tote him about the house. I'm not so sure if he would like that. Plan B--make it into my new fashionable purse. I think I could fit my lunch and wallet in it beautifully. Oh cool, count me in! I think I would use it at a crochet project bag. It is much more stylish then the plastic one I use now. 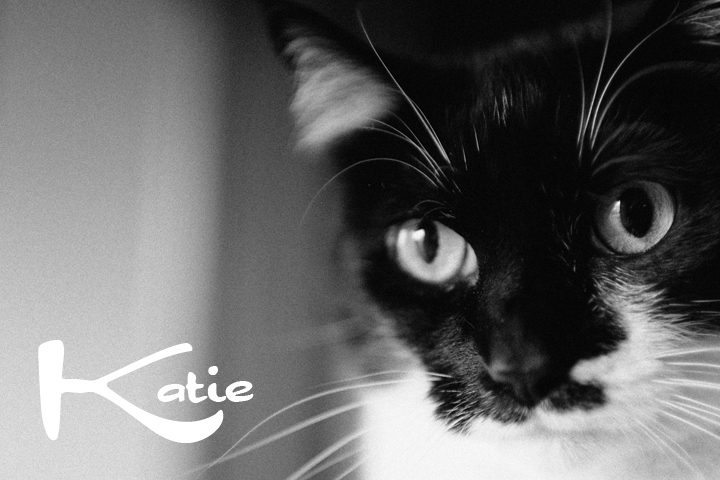 . .
Hey there, Katie! That tote is awesome! If I were to win... I think I'd put in it... hmmm... mabye me! Peep could carry me round like a baby or something. On second thought... maybe I'd fill it with treats & nip to make sure there was an endless supply of the stuff. Well, we would put treats in it, but Meowm would probably put all those purse type things in it. Wallet, cell phone, the kitchen sink......you know, basic necessities. if we winned this tote katie; it be be tote in trout !!! ooooh, I've been trying so hard to win one of those bags. I'd put all my toys in it when I wasn't using them but TW says SHE'D have more use for it. She said it's the perfect size to carry all the stuff she brings to Yankee games: the big bag of cracker jacks, bottled water, Yankee hat, M&Ms, tickets, and maybe even a jacket. She'd be stylin' and that's something cos she's so old. Love those b&w photos of you. They be artsy fartsy. I'd love to win this! I would make mom take it to the pet store and fill it up with lots of treats and toys!! Cat treats, we will.. I mean SHE will fill it with cat treats and let me.. I mean give it to my kitties to eat..
Jack.. no no.. I mean The Momma..
Me would give the bag to my Mommy. The purse she is using is all ratty. Then she could put my iPad in it and my Nellie Pen (that she uses for writing) and her Nellie notebook and purrhaps she could get a new wallet. Her cards falls out of her old one. As a matter of fact, my Mommy needs a makover. she has no class. Right now she is wearing orange fluffy socks, a turquoise tshirt and red shorts and PINK Dawgs. Does yous do Mommy make overs? We would let our Mom use the tote......to bring home TREATS! Okay...maybe she could use it for some of her own stuff too...like the wallet that holds the green papers that she uses to buy TREATS! Mom would put quilting things in hers! We would rather fill it with kitty toys and treats! I would like to enter. If I won, I would fill it with catnip and dive in! We would fill that tote with lots of cans of stinky goodness...and treats, lots of treats...and some toys too...oh yeah, nip, can't forget the nip!! When I see my human wear this, I will know that this purse will be holding an abundant amount of yummy treats and canned food just for me. We would make sure the tote was filled with our favorite treats! Oh this bag would literally be my mobile office! First of all, when I feed the riverfront cats, right now I carry two large bags of dry food, 12 cans of moist food, 7 water bottles, 10 paper bowls (for one station with ants)paper towels to clean other ceramic bowls...It's a lot that I have no room to carry the "admin/marketing stuff". Yes I am a feeder/office in one. Got to maximize my time out there. The tote is gorgeous! I would ned it to Mom to put things for the Baby in when she helps to take care of her. Or she MIGHT even give it to Audrey's first Mom to use as a diaper bag for the baby. We, of course, would keep all the cat stuff for sure! OOpsie, we think our email from comments goes to our gmail account which we don't read. So IF we were fortunate enough to win, please email us at simbasantics at me dot com. Oh, how I would LOVE to win this bag! I've had a rotten week and it certainly would be a pick-me-upper. I would put a small knitting project and my kindle into my new bag. Thank you for the wonderful giveaway! If we won this for our Momma she would put lots of kitteh treats in it when she goes shopping for us! I would put my new kindle and a snack in the bag, maybe even a snack for Enzo. Is It Da Plane? Is It Da Bird?